The Panamanian typical cooking is delicious and diverse. It has rices, meats, birds, shellfish, salads, desserts, full plates of a special flavor. Thanks to the diversity of culture among its inhabitants, the Panamanian gastronomy is very diverse. The national typical dish is, beyond a doubt, "The Sancocho"; it consists of a soup made with chicken, ñame, salt and coriander, all this boiled in water. Some of the typical food that are prepared in Azuero are: “buñuelo” [like corn dumpling] (consists of new seed corn that is milled and fried in very hot oil); “carimañola” (milled yucca, which its mass is filled with grinded meat and then it is fried in hot oil); “hojalda” (mass of flour stretched in oval form and then it is fried); patties (it is made of corn or flour and is filled with meat, chicken, cheese and then it is fried); “lechona” (piece of fried suckling pig); “masamorra” (fruit of the pulped” nance” cooked with milk and sugar cane); “mamallena” (it is made with kneaded bread, sugar cane, raising and baked); “rosquetes” (small ring-shaped bread roll covered with sugar and baked). 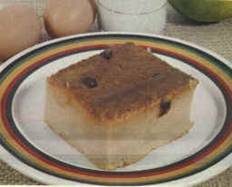 Here is a dessert called mamallena. It is delicious and can be found anywhere on the Azuero Peninsula. All the towns like Pedasi and Pocri have their own signature style of dishes. There is plenty of variety to choose from when dining out in the Azuero Peninsula. 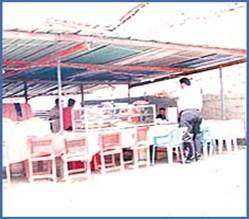 Here is a road side restaurant. They offer foods such has chicken, pork, seafood, soups, and desserts. They are very popular dining spots due to the good food and fast service. You can’t drive 5 minutes along the Azuero Peninsula without seeing one of these road side restaurants. So when you are searching for property along the Azuero Peninsula make sure you stop and sample the local Panamanian cuisine.